← Ocean Heat Content variability. When is the next Ice Age due? All of Human civilization fits neatly into the current interglacial period. The development of agriculture, settlements and societies were all enabled by a beneficial climate for the last 10,000 years. Interglacials usually average ~10,000 years, so is our luck about to run out? It turns out that the answer is no, because we are very fortunate that human society has developed during an interglacial when the earth’s orbit has very low eccentricity. Eccentricity is important because it regulates the strength of polar maximum summer insolation caused by precession of the equinoxes every 21,000 years. Precession determines the distance from the sun during a Polar summer. If summer coincides with the earth’s perihelion then summer insolation can be up to 20% higher than average. However if the earth’s orbit is nearly circular, as it is today, then precession has little effect at all. That is why we have about 12000 years left before cooling begins. The current interglacial period showing how eccentricity is falling to near zero values. Mainly changes in obliquity will regulate future summer melt in the Arctic (blue curve). This reaches a minimum in 15,000 years time. The arrow marks the cross-over in N-S asymmetry. The peak of the warmer Eemian interglacial 120,000 years ago lasted less than 10,000 years, because the much larger eccentricity at that time enabled the first minimum precession summer to increase the spread of northern ice sheets. 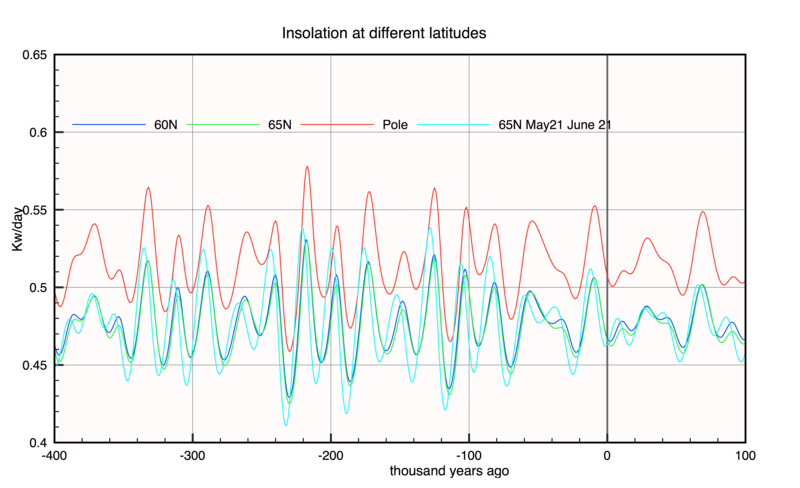 One needs to go back 420,000 years to find a similar glacial cycle to the current one at low eccentricity. This is known as the Anglian glaciation because the ice sheets spread as far south as Anglia and diverted the Thames southwards from the Wash to its current basin. The Anglian had very similar orbital parameters to those we experience today. 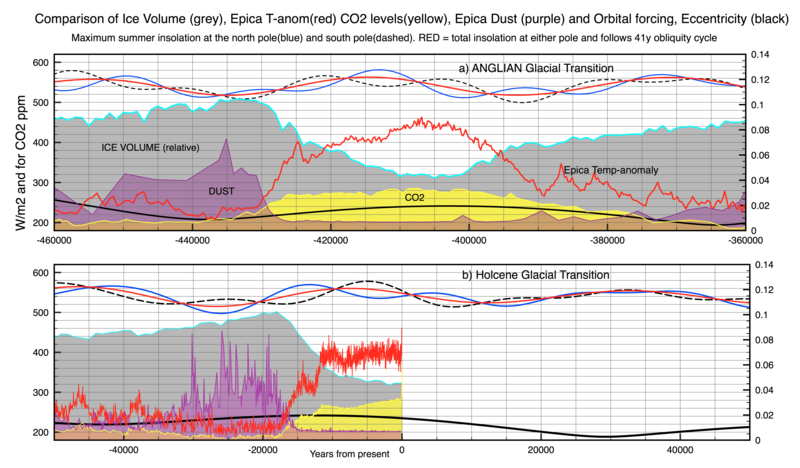 Comparison of the Anglian (420K years ago) with our own interglacial. Note how both seem to have experienced similar Younger Dryas events. However, there are differences in precession evolution with North-South inverted. This result implies that the the current interglacial would naturally last another 20000 years. However, the alignment of precession is not perfect, and the north-south precession cycle is inverted. Despite this, at very low eccentricity, it is only obliquity that really counts. We conclude that within 12000 years the earth would naturally be returning to a new ice age lasting 100,000 years. The earth then enters another long period of high eccentricity lasting a further 400,000 years. Future Interglacials will last only ~10,000 years, before the cycle repeats. One only needs to look at how transient interglacials were 600,000 years ago when eccentricity was high. Note how the obliquity cycle reasserts itself when eccentricity is high. 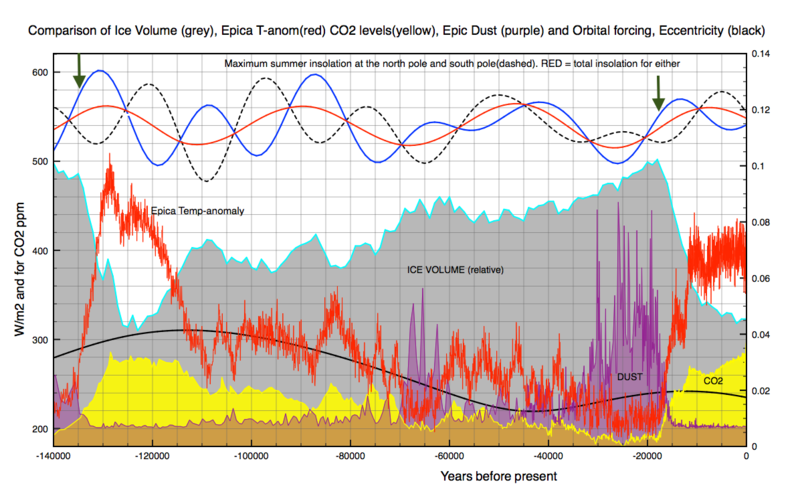 The glacial periods 600,000y ago and 300,000y ago are essentially co-joined 41k cycles. Now we look at an even more remarkable correlation. Eccentricity has an even longer cycle with a time base lasting 2.8 million years. The following plot is the result of calculations by Laskar and his group covering 50 million years. LA2010 calculations of the earth’s eccentricity over a 4 million year period spanning the present day marked by the arrow. Notice how the long term pattern repeats a similar beat to 2.8 million years ago. 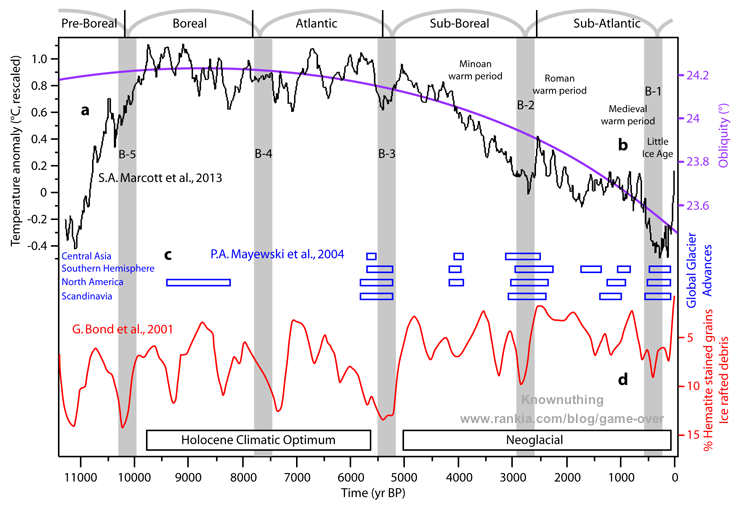 The mid-Pliocene was much warmer than today with CO2 levels similar to those caused by man today (400ppm or above). This is about as warm as most climate models predict the earth will be by 2100 – i.e. about +2C above current temperatures. The full 5 million year record of Benthic Fora data gives clear evidence of Milankovitch cycles throughout the period, including a 420K eccentricity cycle in earlier times. 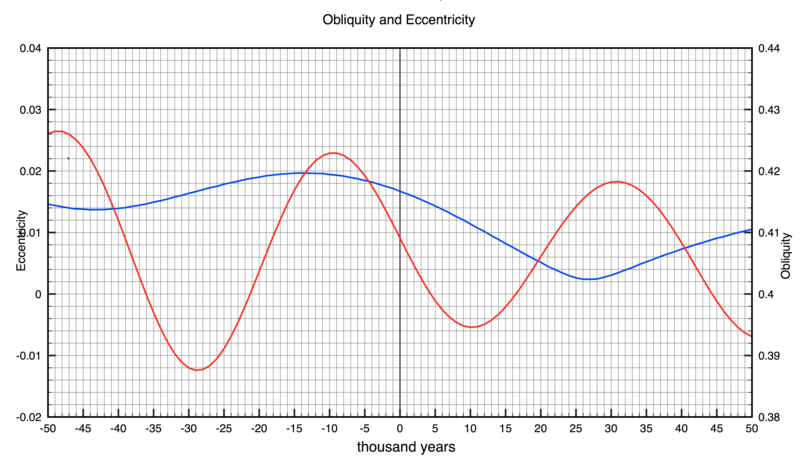 However by 3 million years ago glacial cycles had begun to follow a regular 41K obliquity cycle. It was only much later (< 1 million years) that 100k deep glacial cycles began. 5 million years of benthic foram deltaO16 data. The blue curve is a fit to Milankovitch harmonic data. Comparison of the Benthic Fora ice volume data (shaded grey) with eccentricity (black), Obliquity (purple) and Polar insolation (blue-north, dashed-south). Average (red) follows obliquity. Cycle follows obliquity except for two shaded areas. Even 2.8 million years ago it seems that the decrease in polar insolation due to decreasing obliquity needed a helping hand to enter another glaciation period. Even without human induced increases in CO2 the current interglacial was set to last nearly as long as the Anglian. The minimum obliquity is due to be reached in 11,000 years time and a minimum Arctic summer in 13,000 years time. 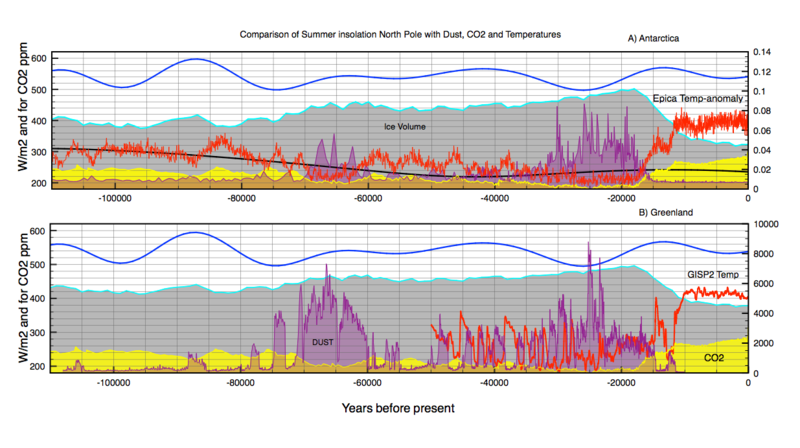 A spread in ice sheets and cooling would normally be expected to have started before then. Has global warming delayed this process and if so then by how much ? If we assume emissions continue to the end of this century and then reduce as we develop other energy sources, then the temperature response might look something like this. Long term predictions assuming non-carbon energy sources post 2100. 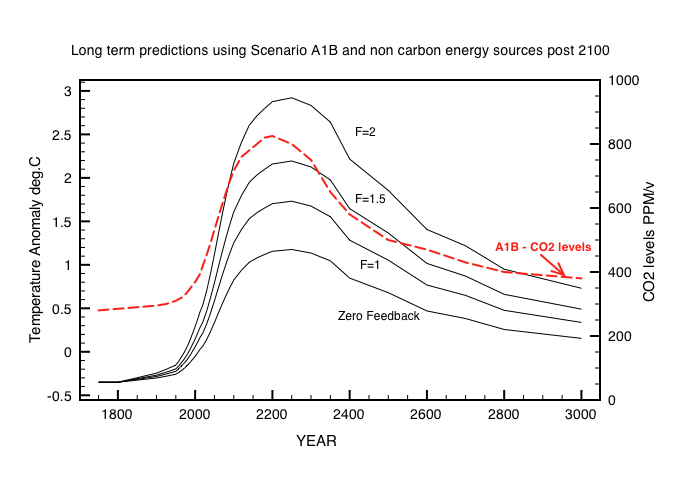 The 4 feedback factor curves labeled F are based on the red CO2 level curve labelled A1B. They are equivalent to climate sensitivity. We can argue about how warm the peak temperature will get and CMIP5 models vary about this roughly between 2 and 5 degrees. However this manmade climate disturbance should last for not much more than 3000 years so long as our emissions are reduced before 2100. The real question is what level we should then try to keep CO2 to avoid another devastating glaciation in 13,000 years time? If we want to survive long term then probably we should never let CO2 fall below 300ppm ever again! This entry was posted in AGW, Climate Change, Ice Ages and tagged Ice Ages. Bookmark the permalink. 49 Responses to When is the next Ice Age due? I was under the impression, not being an expert on this subject, that the Earth’s tilt was the primary driver for ice ages? Yes it is the primary driver. Maximum tilt increases summer insolation at both poles and for about 3 million years it drove the glacial cycle on earth. But the earth cooled so much that 1 million years ago the cycle shifted to (also) coincide with maximum eccentricity. Tilt alone was insufficient and needed a helping hand from the extra modulation of insolation caused by eccentricity and precession. Between the Silurian and Ordovician ages co2 was 7000 ppm and didn’t drop below 4000 ppm so I don’t hold out much hope of co2 postponing the next glaciation. Why polar insolation when most people use 65° North ? I agree that 65N is usually used, but 90N and 90S are symmetric about the obliquity cycle and highlight the effect of precession. In the end they give the same answer. Another major problem is that Milankovitchism became so ingrained in climatological thinking that most published datasets, the synchronization of Marine Isotope Stages, and time scales such as the SPECMAP chronology have all been “orbitally tuned” – i.e., the timing of events has been artificially shifted so that they occurred when Milankovitch theory said they should. This procedure was intended to correct dating errors and to provide a basis for comparing records from different sources, but it also conceals timing differences that may be important. In particular, it makes no sense to orbitally tune events and then to point to their correspondence with Milankovitch cycles as proof that Milankovitch is correct. In 1999, the participants in a major international workshop on the Eemian climate transitions (called the Eemfest) concluded that “the mechanism of this change, the most important puzzle of climatology, remains unsolved” and they agreed that they “strongly discourage dating local climate proxies by unsubstantiated links to astronomic variations” – i.e., orbital tuning. Undoing the mischief caused by this folly would take a lot of work that nobody wants to do, because it is not only tedious but probably embarrassing. Another issue is that Milankovitch offers no explanation for the slow decline of the average temperature during each glacial stage, nor for the millennial-scale Dansgaard-Oeschger events. The stadials and interstadials during a glacial stage (and also the longer-term alternation of glacial and interglacial stages themselves) show a rapid rise in temperature, followed by a slower decay. Some analysts (I am one of them) see this as a pattern that is characteristic of relaxation phenomena. In this model, the climate system exhibits multiple largely unforced but coupled relaxation cycles, which influence each other in complex ways – and they may also be triggered or entrained by quite small external events, including Milankovitch cycles among other possibilities. The cycles are powered primarily within the climate system itself, by transfers of energy from one reservoir to another, so calculations based on the radiation energy balance of the Earth may be irrelevant. If Henrik Svensmark and friends are correct, one of the triggers may be changes in the flux of galactic cosmic rays (GCRs) reaching the Earth. In that theory, GCRs nucleate low clouds, so that the albedo varies with their intensity, changing the global temperature. An increase of 3% in the average global coverage of low clouds would be sufficient to offset all the forcing from 1750 to date due to anthropogenic CO2 emissions, as calculated by the IPCC. If however the climate is subject to internal relaxation cycles, much smaller forcings may be enough to trigger substantial changes. Variations in solar activity affect the interplanetary magnetic field, which deflects GCRs, so their intensity on Earth increases when sunspots are few. Svensmark theory thus explains the fact that severe cold spells have always been associated with Grand Solar Minima, the multi-decadal episodes with a very quiet sun that occur every few centuries. The current 11-year Schwabe sunspot cycle is #24 since systematic records began in the 18th Century. It peaked in 2014, and it is the weakest in 200 years. Solar physicists predict that the next peak, around 2025, will be weaker still. It is thus highly probable that a new Grand Minimum has begun (it has already been named the Eddy Minimum, after astronomer Jack Eddy, whose seminal paper in 1976 pointed out the connection between sunspots and climate). 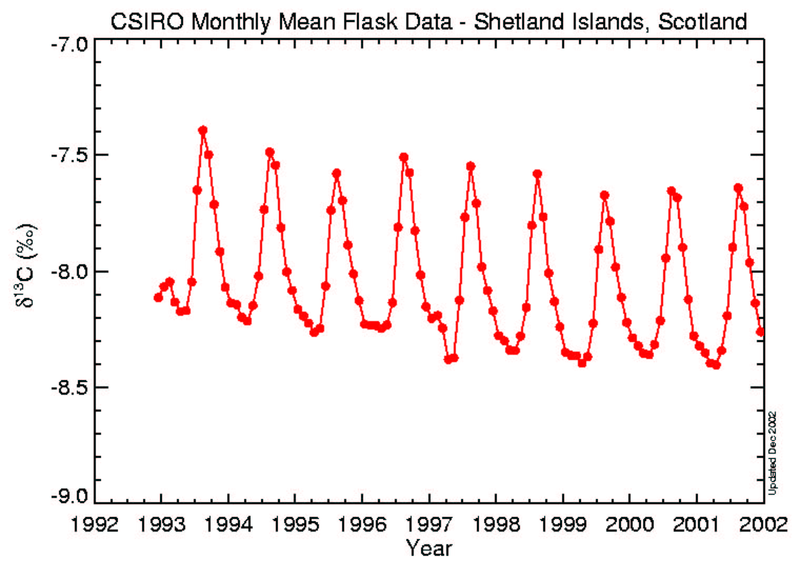 If so, the hiatus in warming that began around 1999 will morph into significant cooling during the next few decades. The IPCC has “high confidence that 21st Century solar forcing will be much smaller than the projected increased forcing” due to greenhouse gases. The same claim is reiterated without proof, as if it were self-evident, in many publications by affiliated authors. All of these claims are based on the absurd delusion that the very small changes in brightness are the only solar phenomena that could possibly influence the terrestrial climate. The flux of GCRs is also affected by changes in the geomagnetic field. For reasons that are not well understood, the N&S magnetic poles swap places at intervals (called chrons) of a few hundred thousand years. The last swap was 780,000 years ago. The field also undergoes temporary collapses and/or reversals, called Geomagnetic Excursions, which typically last from a few centuries to a few thousand years. There have been 16 of them confirmed in the current Brunhes chron. The last one, called the Laschamp Event, was 40,000 years ago. The strength of the geomagnetic field has been decreasing at a rate of 5% per century ever since systematic ambient magnetic measurements began in the mid 19th Century. Around 2000, the rate of decline suddenly increased by an order of magnitude, to 5% per decade — and the collapse may be accelerating. The north magnetic dip pole (i.e., the point where the geomagnetic field is vertical) has been drifting around in northern Canada for centuries, moving between 1 and 10 km per year. In 1998 it underwent a sudden, spectacular acceleration to 55 km/year, which is just as fast as it moved during the Laschamp Event. It is now at 86oN, and racing past the geographic pole toward Siberia. If this continues, compasses will be pointing at some place in the tropics within 150 years, but the field will probably disintegrate long before then. These data indicate beyond much doubt that a new Geomagnetic Excursion has begun. If the Svensmark Effect is real, the resulting increase in GCRs could strongly exacerbate the cooling due to the Eddy Minimum – and it could last for centuries. Our civilization might thus be facing a critical challenge that is without any precedent in our collective memory. The situation could be much worse than that. Changes in the concentration of the isotope 18O in records such as the Vostok ice core reveal paleotemperatures, and spikes in the cosmogenic isotope 10Be indicate Excursions. Those that occurred during glacial stages seem to have been associated with stadials (i.e., even colder spells). Much more ominously, ALL the known Excursions that occurred during interglacials happened as they ended. Since this is quite unlikely to be coincidental, it appears that the steep cooling during an Excursion may be part of the trigger that causes the glacial transition. The implication is that we may have begun the slow descent into colder winters, year by year and century by century, until many of the northern advanced countries are ground to dust under 10,000 feet of ice. In that appalling event, the present benign conditions will not return for a thousand centuries. That is an unimaginable stretch of time. It might as well be forever. The fact that interglacials terminate at fairly regular intervals may mean that the geodynamo is part of the climate system, with its oscillations coupled to relaxation cycles in the atmosphere and oceans via the Svensmark Effect, in combination with other forcings such as variations in sub-Arctic insolation. Given the potential severity of the consequences, the apparent link between magnetic fields and the climate has become one of the most crucial scientific issues of our time. It is not sufficient to dismiss the connection as unproven: unless or until it is categorically disproven – i.e., beyond virtually any doubt — common sense and prudence demand that we take it seriously. Widespread alarm is not yet warranted, but careful analysis of the hazards is clearly justified. A flip any time soon in the geomagnetic field would indeed change dramatically the flux and direction of solar wind and cosmic rays, especially if it took a few hundred years to complete. It must also have an effect on the climate. There is almost zero doubt that the geomagnetic field is disintegrating. It is happening NOW. The dipole moment is falling fast; the N magnetic pole is racing south; and the field is losing its dipole character: the South Atlantic Anomaly is expanding so quickly that it will cover most of the southern hemisphere by 2050 if it doesn’t slow down. This is very probably a geomagnetic excursion, not a complete semi-permanent reversal, so it should be all over in only a few centuries. There is a significant risk that during that time we will see the most frigid conditions since the mammoths died, and a small but not zero risk that the excursion will trigger the next global glacial stage. Of course the global warmers don’t want to hear this, but the evidence is absolutely incontrovertible. Google ESA’s SWARM satellites, NOAA’s geomagnetic pole tracking, and the South Atlantic Anomaly. An excellent post by Phil. I just don’t agree with the choice of Eddy since Landscheidt essentially predi tbe current cooling. Last time a poll was held amongst sceptics, Landscheidt came top. The next poll held on wuwt they didn’t include Landscheidts name, election fraud seems to be something of a tradition in the USA. I appreciate that Eddy was responsible for getting Maunders name on the Maunders minimum, but as Landscheidt predicted this cooling event I believe he should have his name on it, not the establishments choice of the establishments member. I could settle for shared honours, say the Landscheidt-Eddy minimum. Landscheidt is unpopular because his work on planetary influences is widely dismissed (probably quite unfairly) as not much more than astrology. Magnetism is the Cinderella of climate science, but I believe that’s where the real understandings will come from. Clive, very interesting and your graphics are a great reference. I have one thought for you to entertain. The center of mass during the Northern glaciation was not at the pole, but perhaps around 55N. If you’re kicking around trying things, perhaps another version of the comparison but with peak insolation at 60N instead of 90N? Yes I can certainly try 60N. There are indeed some subtle differences with latitude. Everyone seems also to use the average insolation for June. The North Pole receives more insolation than anywhere on earth in June! Far more than at the equator. 60N ,65N and 90N are essentially the same apart from a linear offset using a study moth Jun21-Jul20. The most difference is in changing the month. So I also plot the result for 65N using May 21 – June 20. So the maximum insolation reaches a minimum depending on the month. In other words spring melt maximum occurs some a couple of thousand years before maximum summer insolation. I wonder if this is important. Thanks for indulging my question. As to spring and summer timing, perhaps duration of meltseason in addition to intensity? Great to see that you are optimistic about the extension of the Holocene. The good life could continue for our successors. • the last millennium 1000AD – 2000AD has been the coldest millennium of the entire Holocene interglacial. • each of the notable high points in the Holocene temperature record, (Holocene Climate Optimum – Minoan – Roman – Medieval – Modern), have been progressively colder than the previous high point. • for its first 7-8000 years the early Holocene, including its high point “climate optimum”, had virtually flat temperatures, an average drop of only ~0.007 °C per millennium. 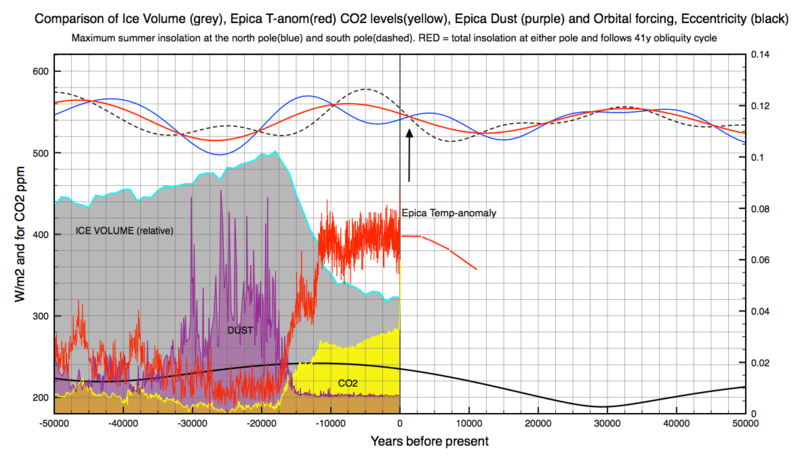 • but the more recent Holocene, since a “tipping point” at ~1000BC, has seen a temperature diminution at more than 20 times that earlier rate at about 0.14 °C per millennium. • the Holocene interglacial is already 10 – 11,000 years old and judging from the length of previous interglacials the Holocene epoch should be drawing to its close: in this century, the next century or this millennium. • the beneficial warming at the end of the 20th century to the Modern high point has been transmuted into the “the Great Man-made Global Warming Scare”. Yes even Marcott et al. show a holocene maximum which coincides with the peak in Obliquity. So the earth is tilted over to its maximum extent and each summer each pole receive more sunshine. So we had people living in the Sahara etc. There has been a slight cooling since then but not yet on the scale of a new ice age. The minimum obliquity is due in about 12,000 years time, so by then we should already be heading into the big freeze. Have you been following the recent reporting of relatively firm dating of a nearby supernova whose effect on earth started 2.7 million years ago — as evidenced by excess Fe60 isotopes? I was startled to read this because generally the first glacial period of the quaternary is dated to about 2.6 million years ago. I wonder if this was the “helping hand”. Exactly 2.7 million years ago the earth seems to have got itself stuck in an 80,000 year long cold spell. A reasonably high increase in obliquity apparently had no effect. I wonder if that was when the solar system was moving through a cloud of debris from the supernova? Interesting article, but reaches the wrong conclusions for starting from wrong assumptions. Precession was antiphasic during the Anglian. That looks like the real reason the Anglian was long. 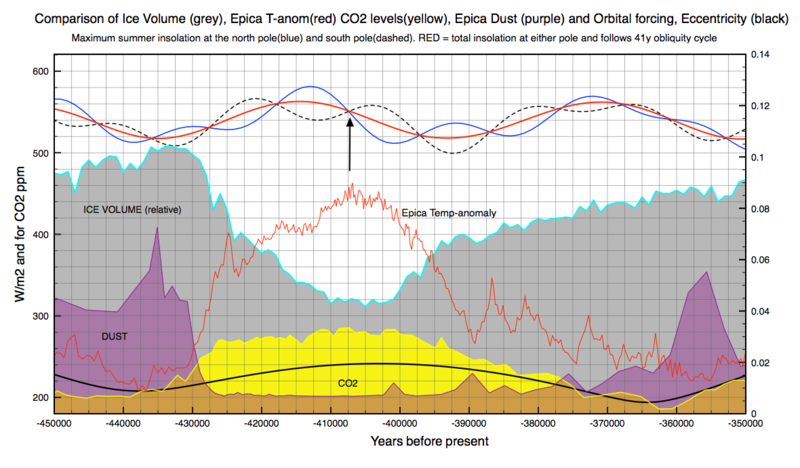 Oz4caster aligned the interglacials by temperature, setting the zero for the first time Epica Dome C temperatures reached zero anomaly during the interglacial. The alignment is very good. And the second graph is for the precession index. a) Obliquity sets the pacing of interglacials, as aligning the interglacials results in an alignment of obliquity cycles. b) MIS 11 (Anglian) was long probably because precession index was not going down but up after 10,000 years of interglacial. c) Holocene configuration points to and end of the interglacial in 1,000-4,000 years. More interesting conclusions can be drawn on why some interglacials like MIS 7 are shorter than average. As far as I know long interglacials are very rare, because they should not start with precession going the opposite way. Keeping CO2 levels up sounds like a good idea, but we are running out of fossil fuels. They won’t last more than a few centuries at most. I wonder if we can burn enough limestone in solar ovens. Yes precession during the Anglian and Holocene were 180 degrees out of phase. So I assume you are arguing that the enhanced NH insolation in the middle of the Anglian interglacial gave it an extra boost. Is that right ? Are you also saying that the current interglacial is about to end as we now have a minimum for 65N insolation ? What is your prediction? Otherwise I agree with you that as obliquity reduces, the earth will slowly slip into another glaciation. But that is still at least 10,000 years away. The other thing we have to be careful about is not to base all our conclusions on the Epica ice core data in Antarctica. Most people assume it is the NH that drives glacial cycles. Here is a comparison of EPICA with the GISP2 Greenland data with Epica. This shows clearly that temperatures have been reducing in Greenland for about 8000 years but this is not evident in Antarctica. The reduction follows obliquity so this should continue to its minimum in about 10,000 years time. However you define an interglacial, this one is likely to continue for at least another 10,000 years. By then future generations (if we make it that long) will be grateful to us for global warming thereby delaying yet longer the next big freeze. It seems probable, doesn’t it? Why the only interglacial that has precession out of phase is the long one? “Are you also saying that the current interglacial is about to end as we now have a minimum for 65N insolation ? What is your prediction? I suppose we have the problem of how we define glacial inception. The formal definition that when permanent ice sheets start to grow in northern continents is not very functional. Waiting for temperatures to reach average glacial levels after a prolonged descent is not practical. In general scientists try to pinpoint when climate takes a divergent path from its interglacial state. If you go to my Epica graph above and move rightward from 0 (131,400 years for the yellow curve) 10,600 years, that takes you to a point we have already passed. If you use the MIS19 analog, temperatures reached an inflection point and started going down faster in about 1500 years from where we are in a nearly identical orbital configuration. I believe the Little Ice Age provided a primer of what a glacial inception looks like, but it was luckily aborted by the post LIA global warming in which we still are. Our next appointment with the ~ 2400 yr solar cycle is in 2000 years. I believe that is when there is an increased probability that the current interglacial would come to an end and ice sheets will start growing in Northern Canada. Our current 65°N summer insolation is quite low and will remain so for thousands of years, and obliquity is going to continue falling. We won’t see if the people two millennia from now will be capable of dodging that bullet. I remain skeptical. Interesting. The problem with ‘climate’ science is that no controlled experiments can ever be done to test theory. This is also true of climate models. No-one knows if climate sensitivity is as low as 1.5C or as high as 4.5C and this hasn’t changed since 1990. No-one really knows either at what level warming is beneficial or a disaster. However we do know from geology that another ice age would indeed be a disaster. There is still a hope of developing a theory of glacial cycles which can describe the past. IPCC scientists however will probably never know whether they were right or not within their lifetime. In 10,00 years we will be nearly 10 degree colder, I would think that life will become difficult for parts of the Northern hemisphere long before then. You seem to be measuring the Holocene as going all the way down to minimum obliquity. I would suggest 2 to 4 degrees below the modern normal as marking the end of the Holocene, giving us ~ 3000 years of time to work out how to prevent it. Nope. Those are Antarctica degrees. The difference between Last Glacial Maximum and current temperatures for the global average are estimated at ~ 5°C. The temperature difference in global average between the Little Ice Age and early 20th century is estimated at only 0.5°C. The problem with the global average is that the tropics change temperatures very little, and they make for almost 2/3 of the world surface. If the global average drops by 1°C we would be in a very serious situation. By 2°C it would be catastrophic for the mid- high-latitudes. The dangers of climate change are severely skewed towards the cooling side. Javier. The graphs you show above depict a rising trend for the holocene whereas it is most commonly accepted that the Holocene had a declining trend as this graph of yours shows. From which it is clear that obliquity drives the general trend and will deliver planet earth into a glaciation regardless of anthropogenic co2 contributions. The point of inflection of obliquity on its own, ie. the steepest drop, is about 500 years away. At some point any temporary warming will be overwhelmed by the ongoing reduction in solar activity and the immutable changes in obliquity. Future generations will need to find a way to warm the planet, to prevent the next glaciation from taking place. Or reduce the population by billions so that the remaining population can survive. Looking at the graph above it would seem that the point of inflection is several thousand years away. I mentally worked it out at about 500 years away. Does anyone know the accurate number of years to the point of inflection in obliquity ? If by inflection you mean minimum obliquity then the answer is in 12,000 year time. So we should be well on the way into another glaciation by then. That is unless we can keep CO2 levels artificially high long term ! The halfway point between maximum obliquity and minimum obliquity. That is also the point at which the rate of change is greatest. The point of inflection, defined as the point when a curve goes from increasing its speed of change to decreasing it, has to be close to its midpoint in this case. Maximum obliquity was 9500 years ago. Minimum obliquity will be about 10500 years from now. The point of inflection should be close to 500 years from now. At that point the reduction in obliquity is maximal per unit of time. Currently the Earth is tilted at 23.44 degrees from its orbital plane, roughly halfway between its extreme values. The tilt is in the decreasing phase of its cycle, and will reach its minimum value around the year 11,800 CE ; the last maximum was reached in 8,700 BCE. Adding 2000 yrs to BCE and subtracting 2000 from CE would put the next minimum in 9,800 years and last maximum 10,700 years ago. If that is correct the maximum rate of change, inflection, is 450 years. These are the Laskar’s calculations . Looks to me that the minimum in obliquity is predicted to be in ~10,000 years time. It is difficult to be precise as the turning point is rather flat. I am not sure that maximum inflexion is really relevant either. This is a mystery yet to be resolved ! Don’t worry – we will all have learned how to survive on ‘renewable’ energy by then i.e. horses. Horses make the best use of solar energy and provide natural energy storage. Furthermore they reproduce themselves with very little maintenance costs. They powered Europe and most of Asia for a couple of thousand years. Can you imagine wind turbines doing the same? 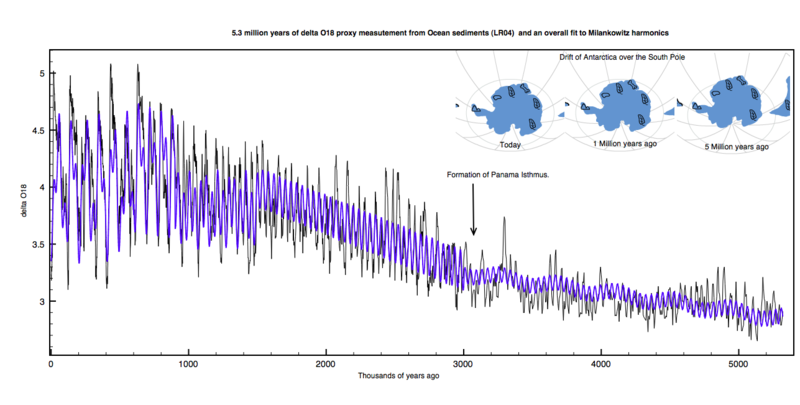 Those graphs represent temperature changes in Antarctica, at Epica, not global temperatures. During an interglacial polar temperatures follow insolation, that is anti-symmetrical between the poles. So to get proxies for many interstitials we must use Antarctica even though they may not look much like what took place in the Northern hemisphere, making it more difficult to assess when when and at what pace we slide into glaciation. Sea bed cores perhaps ? Clive: Did you make all these figures? I assume so. They are beautiful. Thank you for the post. I will take heart that my grandchildren will not freeze. At the end of the post, you have reproduced a prediction that CO2 levels will rise above 600 ppm if we keep emitting CO2 as we have been doing (10 Pg/yr of carbon emitted). But that can’t be true. An analysis of the fate of the 8 kg/yr of carbon-14 created by cosmic rays shows that it will take six thousand years to double CO2 if we keep going at the current rate. I have a write-up here, if you are interested. Yes they are all my graphs. I read your CO2 post and agree with the logic. The residence time for CO2 is around 15 years. I came to the exactly the same conclusion as you did. but we have forgotten about the chemistry of CO2 and water. There are two different ways CO2 dissolves in water – molecular CO2 and ionic CO2. The later forms carbonic acid is as carbonate is absorbed by shellfish which die and fall to the bottom of the oceanand. Those acts over much longer timescales. I don’t claim to understand it all but the claim is this is why the BERN model has terms with e-folding times of 200 years and > 1000 years. Here is a post that tries to address this – not completely to my liking though. Re: Graphs. Do you do them in Excel? If so, your powers are far greater than mine. The CO2 chemistry is indeed interesting. But it is insignificant compared to the requirement that a net 8 kg of carbon-14 must flow out of the atmosphere every year, that there must be 64,000 kg of carbon-14 on Earth, and that there is only 800 kg in the atmosphere. These three facts are severely constraining, and yet I have so far found no mention of the creation rate of carbon-14, nor a calculation of the total inventory of carbon-14, in any recent atmospheric literature. I had to go back to 1956 to find the calculation. I cannot conceived of a more perfect way to trace out the Earth’s carbon cycle than to put 8 kg of carbon-14 in the atmosphere for the past million years. The only two-reservoir model that fits the data predicts correctly the bomb test aftermath, the CO2/temperature correlation of the past 400k years, and the present CO2 response to human emissions. If we come up with a more complicated model, it still has to fit the carbon-14 data. Here, let me illustrate the power of the carbon-14 observations. Suppose we say that the atmosphere communicates only with the top 1 km of the ocean, which contains only 10,000 Pg of carbon. Well, the concentration in the top 1 km is 96% of the atmospheric, and atmospheric is around 1ppt. So we have to have 200 Pg of carbon being exchanged every year for 8 kg net carbon-14 transport out of the atmosphere. If we double the CO2 concentration in the atmosphere, maybe we could argue that we don’t double the absorption rate into the top 1km because of some acidification or whatever, so fine: don’t have it double, have it increase to 300 Pg/yr, okay. So we put put a pulse of 800 Pg carbon into the atmosphere, doubling the carbon in the atmosphere, and it disappears at 100 Pg/yr. It will all be gone in twenty years. The “adjustment time” is decades. Certainly, none of it will be around in 1000 years. But this model still cannot be true because the 10,000 Pg in the top 1 km is gaining carbon-14 every year even when it is at equilibrium. We have 8 kg entering each year and only 9,600 kg carbon-14 in the top 1k of the ocean, which decays at only 1.25 kg/yr, so we have 6.75 kg/yr of carbon-14 building up in the top layer. So this shallow-ocean model must be modified. There is 6.75 kg/yr moving out of the bottom of it into the deep ocean, where the concentration of carbon-14 is only 0.8 ppt. So there must be roughly 40 Pg/yr of carbon going down from the top 1km into the deeper ocean, and if we increase the concentration in the top 1km, this 40 Pg/yr will increase in proportion. And so on. The only way to account for the carbon-14 is to have a big reservoir with a lower concentration of carbon-14 that is in ready communication with the upper atmosphere. Well, that was long-winded. Well, I won’t delete it. Who knows, maybe someone will enjoy it. No – I only ever use Excel to sort and manipulate data. I don’t like the graphics and can’t get it to work for me. For quick displays I use a free programme on Macs called Plot2, and the graphs above were made mostly with Plot2. For more sophisticated stuff I use IDL which involves a bit more serious programming. A license for IDL is quite expensive however. IDL and its competitor Matlab, are used by quite a few climate scientists. A free alternative however is Python, but that again it involves programming. I like your article a lot. It makes logical sense and I cannot find a flaw in your argument. One correction could be the production rate of C14 from cosmic rays. If CO2 levels rise from 300ppm to 400ppm then the the annual production of C14 rate should rise by 4/3. If we look at the isotope data for atmospheric CO2 we can actually measure how much of the CO2 in the atmosphere is definitely due to man The results are surprising. Fossil fuels contain essentially no C14 since it has all decayed over the millions of years the carbon has been buried. There is also less C13 (18 p.p.thousand) in fossil fuels than in ordinary air because living organisms take up less C13. Therefore we should be able to measure the fraction of the atmospheric CO2 originating from burning fossil fuels by measuring how these two proportions change with time. delta 13C = ((C13/C12 sample)/(C13/C12reference) – 1)*1000 where the reference value is 0.0112372 and corresponds to an anomalously high value cretaceous fossil. “Natural” CO2 has values of -7 permil and CO2 from fossil fuels has values of around -25 corresponding to the 18 permil difference from Houghton’s book . Let us look at the actual measurements which in this case are from the Shetland Islands, Scotland. I see in your comments that you got into a discussion with ATTP who purports to be a physicist. However he is more of a propagandist for climate alarmism and tends to shy away from giving actual proofs based on physical arguments. Well, I must try Plot2. I just tried to download, but I need MacOS 10.9 to run it and I’m still hesitating with the update. My institute has Matlab, and it does a good job, but I have not seem anything from Matlab as slick as your graphs. That one you open with up top is gorgeous. Why would the production rate of C14 rise with rising CO2 concentration? So far as I understand it, the C14 production rate is a function of the number of neutrons generated by cosmic rays, and they are being capture by nitrogen atoms. But you know that. So I’m missing something. Please explain. Thank you for reproducing your line of argument about fossil fuel carbon and C14, how we should see a drop in C14 concentration if fossil fuel carbon was hanging around in the atmosphere. I can’t argue with that. But C14 concentration is now back to its levels before the bomb tests, no lower than that. So we don’t have a significant amount of fossil fuel carbon hanging around. According to my two-part model, the fossil fuel carbon will be sucked into the deep ocean with a 17-year time constant. And it could be sucked into the shallow ocean faster, but my model does not account for interior details of the ocean. Anyway: 10 Pg/yr low-C14 emissions into the 800 Pg in the atmosphere, if they stick around for 17 years would be 170 Pg, and that would be observable as a 20% drop in carbon-14 concentration. But no such drop has occurred. So this suggests that the residence time of carbon-14 in the atmosphere is closer to two or three years, and it’s being sucked into the shallow ocean. In the shallow ocean, which may contain 10,000 Pg, it would have no significant effect. Well, that’s interesting. The carbon-14 tracer just keeps on giving. Yes, I’m in discussion with ATTP and Gavin Crawley, and I am enjoying it. I hope they are too. Thank you for checking my carbon-14 post. I upgraded to 10.11 so had to move to Plot2. This lost the least squares fitting functionality which was really useful, but added some extra graphics features. My comment on C14 levels was based on the assumption of a fixed cross-section for C14 production per molecule. So if there are more CO2 molecules per cubic meter then I would expect the production rate to increase. As far as I understand it modellers predict that carbon sinks in the ocean will begin to saturate at higher levels of CO2. So instead of half the excess carbon being absorbed each year, 40% will be absorbed in the future. As yet there is no evidence at all that this is actually happening. The other argument is that there are also very slow processes at work that remove carbon from the atmosphere. The main one is weathering of rocks which it is claimed acts as a long term thermostat. This is because the rate depends on temperature. For this reason the BERN model essentially has a constant fraction of emissions which stay in the atmosphere but actually has a thousand year decay time. This is the so-called long tail of CO2 decay. However I like you find this argument confusing for the following reason. If I have a bath full of water with 3 holes in the bottom. The first hole is 10 cm wide, the second 1cm, and the third is 1 micron wide. The water will all empty fast through the large hole and ignore the 1 micron hole. However the Carbon ‘experts’ say no this is wrong. 20% of the CO2 will sit waiting for 1000 years to pass through the 1 micron hole, and ignore the option of dissolving in the ocean ! I have the old Plot2 running on my Mac. Awesome. Now I just have to learn how to use it. Thank you for the link. Carbon-14 is made when nitrogen-14 captures a thermal neutron. The thermal neutron in the upper atmosphere is one of the final products of a cosmic ray shower. The nitrogen nucleus absorbs the neutron and immediately spits out a proton, and so becomes carbon-14. Thus I think it’s the nitrogen concentration and cross-section that dictates the carbon-14 generation rate. Interesting, that’s new to me. I can see how that would serve to prolong the life of human emissions in the atmosphere. That’s a non-linear effect. The analytic solution to the problem would no longer be the sum of a bunch of exponentials. I have also seen the assumption that the flow out of a reservoir is not proportional to concentration within the reservoir, but rather is “linear” with concentration, as if the probability of a particular molecule moving from one to the other was affected by how many molecules there were: somehow they are communicating. Ha! That’s a fine analogy. I have tried to make the same point half a dozen times on my own site. I will try your analogy in the future, with full credit of course, if you don’t mind. Global COOLIST are same conmen as Global Warmist, only different hat; the only difference between them is: Warmist are lying for cash and power -/- COOLIST are lying for feel good, AND for creating backdoor exit for the Warmist. Because after billions spent on research, not a single legit proof of global warming -> so instead of asking them for returning the money looted, Warmist to say: the temp is same as always, because THE phony skeptic’s PHONY GLOBAL COOLING CANCELED THEIR PROMISED GLOBAL WARMING.” shame, shame!! Hi Clive. I could use advice to see if this is a type 1 problem. I sent email to ja curry this morning. I am an elec engr, possibly coolist, heh. Still, the obliquity is falling and the Holocene will end soon… following posted to ‘Nature Unbound ,1’ by Javier. Greetings from Big Mango (BKK)- One reply said interglacials don’t last past obliquity of 23.5, and beginning with the Wolf Minimum at 1275 AD, obliquity = 23.54. Several more minimums follow, with cold spells. The next solar cycle is expected to be another minimum. I expect starting 2020 we start stairstepping down to a glacial phase. “Obliquity is falling and the Holocene will end soon’. Yes that is true but I think it depends on what you mean soon. By my reckoning we probably have another 5000 years to go before the ice sheets begin to expand and temperatures drop significantly. We have luck on our side that eccentricity is so small, because otherwise we would already be in the next glaciation. That is because NH summer insolation is currently at its minimum but without a highly eccentric orbit the fall is not great enough. Take a look at the Anglian which also had small eccentricity. Clive, this is an excellent article and one of the best I’ve seen on Eccentricity. It’s a pity you put the last few paragraphs and chart in. This is based on an assumption that human emitted CO2 creates warming. We no that CO2 does not create warming. Warming causes CO2. It is not the other way around. The cause can’t be the effect. 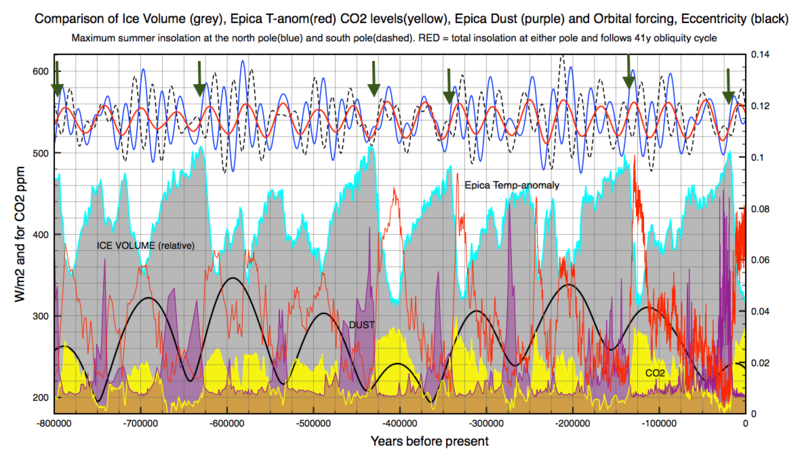 CO2 has been lagging temperature for the past 1 million years by approximately 1,000 years. The greenhouse effect is a myth: The Shattered Greenhouse: How Simple Physics Demolishes the ‘Greenhouse Effect’. Timothy Casey B.Sc. (Hons.). CO2 has a net zero effect: An Updated Review About Carbon Dioxide and Climate Change Fleming, 2018. Greenhouse gases cause cooling not warming: SURFRAD Data Falsifies the “Greenhouse Effect” Hypothesis Published on October 6, 2017 Written by Carl Brehmer. CO2 fell to 180ppm during the last ice age. That is just 30ppm short of all plant life going extinct. Our food comes from plants so we were 30ppm short of human extinction. We need more CO2 in the atmosphere not less to restore the balance. THE POSITIVE IMPACT OF HUMAN CO2 EMISSIONS ON THE SURVIVAL OF LIFE ON EARTH BY PATRICK MOORE | JUNE 2016. Add to that only 4% of all annual emissions come from humans. Global and Planetary Change Volume 152, May 2017, Pages 19–26. Scrutinizing the carbon cycle and CO2 residence time in the atmosphere Hermann Harde. You haven’t explained whether or how the remaining 96% of natural emissions do not cause warming. High CO2 has never stopped cooling over history, we entered an ice age 450 mil years ago when CO2 was 4.000 ppm. Your paper also does not factor in the 2019 to 2033 elliptical pull by the 4 large planets that will pull the earth 8 to 12% further out into an elliptical orbit. Additionally Zharkova et al have calculated grand Solar Cycles and have predicted a Solar Minimum over cycles 25, 26 & 27 from 2020 to 2053. She is predicting a 2 degree C drop in global temps. Using a different prediction method, Sharp G.J., predicts a low cycle 25 out to 2030 with a recovery in cycle 26.